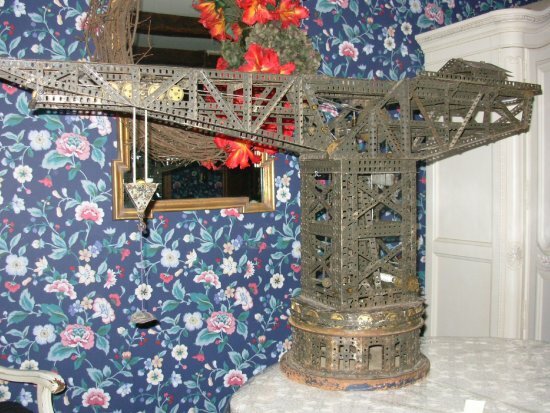 A real antique Meccano model! 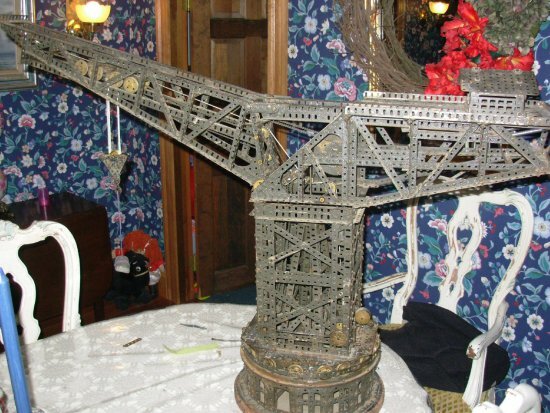 A chap called Jay sent me some photos of this very old crane, and asked whether I could identify any part of it. It's not often you come across something quite so, shall we say, authentic! It looks like it's been overpainted, perhaps when it was originally built or certainly soon after. The Meccano parts are nickel plated, painted with some kind of grotty dark grey or black paint. On this particular model it works perfectly! I believe it dates from around 1925/26 or so. It's always difficult to to this definitively, but we can of course say when it can't have been before, by the existence of some later parts. Here, the most significant one is the 3½" gear wheel as a central part of the internal drive. Introduced in 1924, that means the crane pretty much can't be before that date (it doesn't look like the design was modified later to include this gear). All the cranks visible have the larger circular surround, which was removed in 1925, so the parts can't be much later. 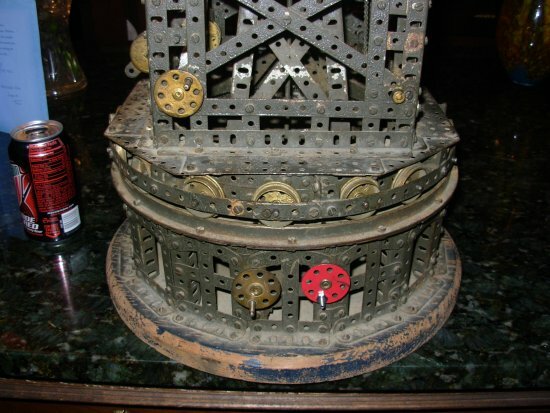 Standard Meccano was all nickel plated up to 1925 (although it was available in nickel after that date). I note that the bolts are a mixture of the shorter and longer bolts -- part 37b was shortened to 7/32" somewhere between 1924 and 1926, so the transition period sounds about right. The only part I can see that doesn't fit into this scheme is the red painted bush wheel, visible on this close-up of the base. However, it's obviously much cleaner and has what looks like a zinc-plated non-Meccano threaded pin as a handle, so this appears to be a later replacement. This close-up shows some very nice building work -- I particularly like the arched sections around the base. Obtuse angle brackets weren't introduced until 1934, but it's perfectly possible that these very obtuse brackets are just fishplates that have been eased into slight angles. We can also see here evidence of a fair amount of mutilation! The flat plates making up the octagonal base are simply cut diagonally, and in many parts of the model where a part doesn't quite fit the builder has simply drilled a new hole where he wanted it! Obviously the circular framework for the bearing is non-Meccano, but it's fairly cleverly integrated. This close-up of the mechanism shows more oddities. In fact, the more you look at each girder, you see that almost none of them are standard lengths! Most of the cross-bracing has been trimmed to fit, and new holes drilled all over the place! I do quite like the curved gussets, though, made from flat plates. What I don't quite understand is the overall mechanism of the crane's jib. The entire jib appears to pivot up and down (angle girders have been trimmed to fit around the large flanged wheels on the axle). Ok, Jay has sent me a couple more pictures, and now the mechanism makes sense. You can see on the right a photo of the jib partially raised. The large horizontal girders at the top of the crane itself slide forwards and backwards, pulling the jib up (it's attached with the pair of cranks visible at the top). You can see from this photo and one above that there are two large (shiny) springs, these counterbalance some of the weight and are constantly pulling back on the horizontal girders. 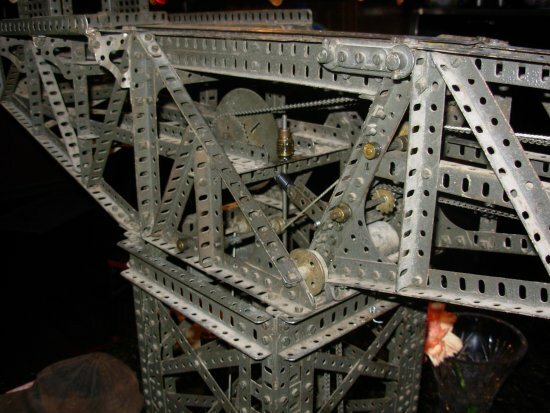 There are a pair of sprocket chains attached to the back of the jib (visible in this picture), which run over the two 2" sprocket wheels and down to a large lead weight in the tower. The 3½" gear in between these sprocket wheels drives the sprocket wheels, from a worm on the central vertical shaft. It's a neat mechanism, but I'd still like to see a prototype crane like this. Our final picture is another overall view, from nearer the front. In this picture you can see the cable drum at the bottom of the tower, and the lead weight above it which holds the luffing sprocket chains on the 2" sprocket wheels and helps the jib up too. The other sprocket chain is running along the jib, attached to the jenny, to move it in and out along the rails. I can't see how the slewing works, but that is presumably operated by one of the bush wheels on the fixed base of the crane visible above. 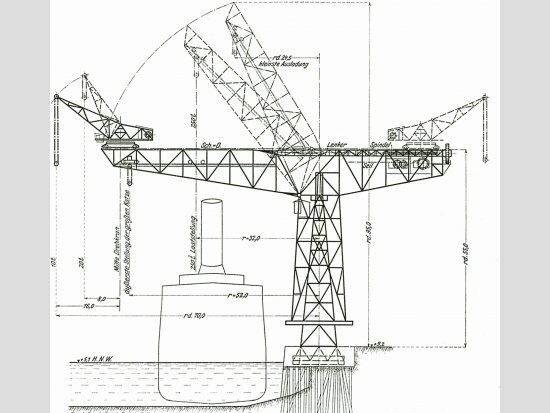 The crane appears to have been built by Deutshe Maschinenfabrik AG (who became Demag), and a diagram is available here. Thanks to information shown below, it does look very like this crane is modelled after the "Hammerwippkran", which was built in the new Blohm & Voss shipyard in 1905, at which time it was the largest crane of its type, with a lifting capacity of 250t. Reference to it is made on the German Wikipedia page here. A picture of the original crane is shown right. 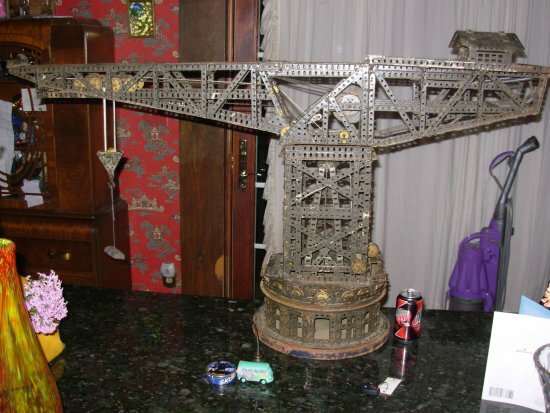 An example of this crane being built from Marklin parts is referenced by Norbert Klimmek (a much better model), although he states that the crane existed from 1913 to 1946. I don't know which of the build dates is accurate. And a bit more digging around reveals us a reasonably good line drawing of the crane, shown left. You can see from this diagram that the original crane also had an auxiliary crane mounted on rails across the hammerhead, and this could travel from one end of the main jib to the other. Very neat! It can clearly be seen that the weight of the crane is borne on the central inner tower -- this ensures that the wheels on the large rotating surface at the bottom of the crane are not taking all the weight. Further information (and better diagrams) is shown in this PDF article. This article shows a date of 1913 again, but Blohm & Voss' own history doesn't show a crane being built in 1913, only in 1905. 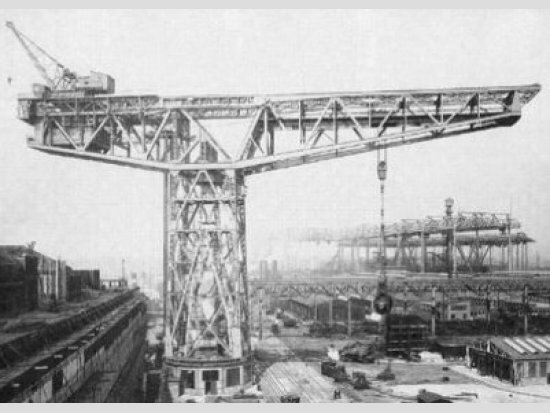 It may well be that the picture shown is from 1913, when the full capacity of the crane was required for the build of the "Vaterland" (later US Leviathan). I love this model. The paint and rust adds to its authenticity and it should certainly not be stripped off in my opinion. I'd love to see it brought back to working order with some appropriately tatty rope and other accessories! It's rare to find such a well-built example of a substantial old model. Most are either newer or so small or damaged they don't amount to much. And, of course, if you dismantled and stripped all the parts in this model you'd probably end up with a grotty pile of parts (and chopped-up parts) worth only a fraction of the model's value. I can contribute some informations about the prototype „Hammerwippkran“ (hammerhead-crane with raisable jib). The above linked PDF article is an extraction of the book „Ein Jahrhundert Deutscher Maschinenbau 1819 – 1919“ (One Century of German Mechanical Engineering) from Conrad Matschoss who wrote it 1919 on behalf of the DEMAG company for its 100th anniversary. After this, the crane has been set in service 1913, which corresponds also to another company publication „DEMAG Erzeugnisse“ (DEMAG Products) from 1935. A third reference ist the book from Hans Juergen Witthoeft „Tradition und Fortschritt – 125 Jahre Blohm & Voss“ (Tradition and Progress) - also available in an English version - where April 1913 is given as date of commissioning, the same month when the 54 282 ton ship „Vaterland“ was launched as construction #212 at B&V. It looks like a different model of the prototype of the well known Märklin "Hammer-Wippkran". I believe that a number were built for use in German shipyards. It looks as though the boom is correctly supported on the top of an inner tower. However, it does not appear to have a little auxilary crane on top of the boom like the prototype.